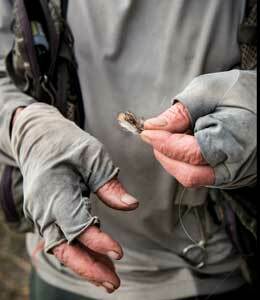 A legendary fly-fishing guide faces down the years in the waters that have been his salvation. Above: Taylor Streit in the Río Grande Gorge. A 2001 inductee to the Fresh Water Fishing Hall of Fame’s Legendary Guide List, he opened the Taos Fly Shop in 1980. THE TROUT MUST be feeding by now in the Río Grande Gorge. Taylor Streit can sense it. He stomps on the gas and his dusty pickup charges down into the canyon, a wooden stepladder clanging off the camper in the back. Inside the camper are all the worldly needs of New Mexico’s greatest living fly-fishing guide: a rod and tackle, some wading gear, a minimally equipped vest, even the narrow bed where he slept last night. Or would have slept, if he’d been able. The truth is, these days Streit is getting old. A night in town means a night spent tossing and turning. His blood pressure skyrockets when he’s away from the wilderness, he claims, and this on top of a sore back after surgery and assorted other aches and pains from a life spent working outdoors. He can’t fish all the places he wants to fish anymore, can’t trek into the mountains or clamber down rocky bajadas to get to the wildest stretches of river, where he’d loose that quick, elegant cast on rainbow that have never tasted hook or hackle. After almost 70 years, the natural world is slowly receding from him. How this must feel to a fisherman of his stature is something that most of us—those who’ve never been really, transcendently good at one particular thing—aren’t equipped to imagine. But there’s no time to worry about all that right now. Not when the trout are hungry. The walls of the gorge get steeper in a hurry. Roadside scrub flashes by. It’s early October, partly cloudy, still warm. Streit pulls around some cyclists and keeps an eye on the river, peering over at spots he’s guided countless clients to over the years. Suddenly he brakes and swerves across the road into a patch of grass. Two men are waving to him from a boat down below. As he climbs out of the cab, the boaters gesticulate with their beer cans toward the far bank, where ripples pock the water like rain. “They’re rising right now!” one hollers. Streit straps on his vest and smiles knowingly. “That’s my pool right there,” he mutters. And those are going to be his fish. A disclaimer: I’m not what you’d call an expert fisherman. My knowledge of the sport comes from the muddy creek behind my childhood home in Texas, where I spent long afternoons dangling chunks of hot dog off the bridge from a bamboo pole. Every once in a while a catfish would snuffle across the bait and I’d hurry to get it off the hook without being impaled by spines or slimed with catfish goo. Duty done, I’d happily return to watching the dragonflies drift in the sun and snagging my line on logs. Real A River Runs Through It stuff, I know. I’d hoped I might wangle a free lesson out of our time together, but Streit saw through me and tactfully neglected to check whether I was familiar with New Mexico’s fishing license policies. Oh well. Later he confided that all the fun goes out of being on the river the minute he starts guiding. That certainly wasn’t the goal here. More than anything, really, I was curious to see a master at work. Streit with his son, Nick (right), and Ron Sedall (left), a guide for Nick’s fly shops. As advertised, Ron springs into action as soon as Streit reaches the water. “There’s three fish from that rock up to that yellow flower,” he announces. They talk flies: There’s a mayfly hatch going on, so the boaters have been fishing a size 18 Parachute Adams, a versatile dry fly that can imitate BWOs, or blue-winged olives, a kind of mayfly. Every fly pattern of the hundreds on display in little cubbies back at the shop is designed to mimic the look or behavior of some kind of insect, and it falls to the fisherman to keep an eye out for what’s buzzing around the riverbanks and find the fly to match. There’s a degree of guesswork to this process, but also a sort of science, or at least a persuasive imitation of one. “You could go up to Los Alamos and not hear as much jargon,” Streit chuckles. A small brown trout, ready for release. The first catch of the day is a gasping 12-inch brown trout, maybe three-quarters of a pound, freckled black with a smattering of orange spots along its lithe green-and-gold body. “He’s big for his size,” Streit exclaims, leaning on his well-worn supply of fisherman’s humor to hide the dissatisfaction in his voice. He wanted to land something photogenic, a magazine hero. This is just an ordinary trout. He slips it back into the water and the fish drifts backward, momentarily stunned, before coming to its senses and torquing off into the shadows. “They’re all going to have sore lips when my dad’s done with ’em,” Nick says, loud enough that Streit can hear him. He’s fallen into a natural guiding position behind his dad’s non-casting shoulder, where he scours the water for the next target as they move through the shallows like a dancing couple. But Streit’s not listening to him now. He’s peering up the river, back in the direction the boat came from. After a moment he shoulders his rod and tells the guys they can go on and keep rowing down toward their truck. There’s got to be something they missed up there. Something big. It must have surprised no one when a teenage Streit moved upstate near the Canadian border to tie flies at 15 cents each for a shop on the Au Sable River. There he worked for a famous fisherman and got a taste of the professional’s life, but he was being pulled in other directions, too. “I was a real product of the sixties, you know,” he says. In his early twenties, he and a girlfriend “pretty much threw everything in a station wagon and headed west.” The road trip ended, as many of its kind did, in Taos. The town got by on a barter economy that had no job listings for professional fly-fishing guides. Streit survived the seventies on a hodgepodge of backbreaking physical labor: surveying, making adobes, fighting fires, working the oil fields down by Carlsbad. In 1975, he married a woman named Mary Lou, who tolerated the two or three days a week that he went fishing even before he got paid for it. 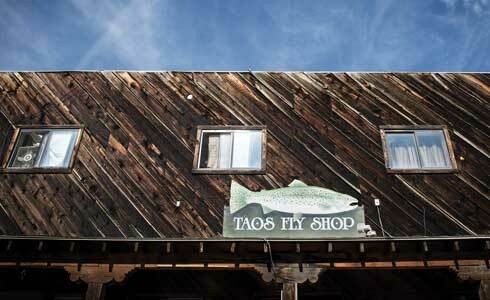 When they opened the Taos Fly Shop, the first in town, in 1980, she would watch the shop while he guided. That same year Nick was born. “I had a fly rod for him that was about three feet long, to give you an idea of how early I started him fishing,” Streit says. Their daughter, Chelsea, still lives in Taos, too, working at a bed-and-breakfast. Streit and Mary Lou later separated. His reputation as a fishing guide grew on word of mouth about the 30-plus fish clients could pull out of the Río Grande in a day. 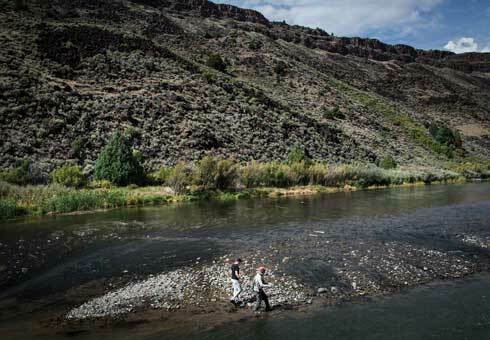 The nearby San Juan is far more famous in fishing circles, but Streit liked the ruggedness and difficulty of the gorge near his shop. The trout, the river, the terrain—everything was wild. 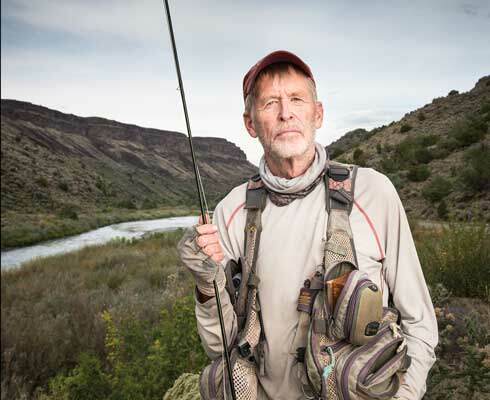 In the late eighties, when runoff from an upstream molybdenum mine killed the river’s fishing prospects, Streit was so affected that he shuttered his shop and took off for years of fishing work in the Bahamas and Argentina. When he mentioned he was from New Mexico, foreigners would ask about the San Juan, and he would simply tell them yes, there was good fishing there. Streit and the author on the Río Grande. Whatever the cause, the ecosystem here seems to have wholly recovered from the effects of the now-closed mine. Juniper and invasive salt cedar dot a wrinkled green quilt of bunchgrass and sagebrush that unfurls from the lip of the canyon down the riverbank, where it ends in a thick fringe of grasses that droop to tickle the rapids. The hatching mayflies feed a resurgent population of wild trout, which in turn keep ospreys circling overhead and eagles nesting in the ponderosas on the far side of the canyon. During a bit of bushwhacking, Streit points out a fresh set of fox tracks along our path. The fishing has been frustrating—a steady trickle of catches, but none that Streit deems fit for Stefan, our photographer. (As a guy whose fame was built in part on articles in magazines, including this one, Streit knows the value of a money shot.) After a couple hours, exhausted and annoyed, he decides it’s time for a break. I see my opening and ask if he might give me a casting lesson. He reluctantly agrees and strips his hooks off the line, ostensibly for permit reasons, though perhaps also to render me less dangerous to everyone involved. Did I mention that Streit makes fly casting look easy? It’s goddang impossible. How such a simple motion can produce such a wide variety of outcomes is hard to comprehend. Not only do my casts fail to send the tip of the line looping handsomely toward a trout-sized target, they often never leave the water at all, or at least not in a forward direction. As far as I can tell I’m replicating Streit’s demonstration—elbow in, wrist tight, nice and easy—but the pain in his eyes says otherwise. “I can’t tell you all the times I was dying to say to the client, ‘Have you heard about golf?’” he later jokes. That he bites his tongue—and that some of us hopeless cases eventually learn, with years of therapy, to land a fish—is what makes him a good guide. The job takes more than expertise. It requires a sense of humor, an appreciation for human fallibility, and, above all, boundless patience. That patience came in handy when Streit decided to start setting down his wisdom in writing. He’d never been much for school, tormented by a flickering attention span that he believes is the evolutionary inheritance of natural hunters, but as Nichols writes in a foreword to one of Streit’s books, “the man had chutzpah.” With long practice, he taught himself to write, often going off in his camper to work in some wilderness where the only distraction was the river. 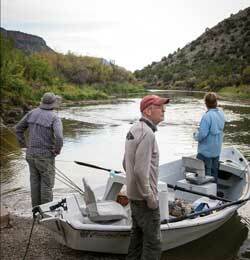 The result, in 1996, was Fly Fishing New Mexico, the first guide that covered the entire state. It sold 25,000 copies and raised Streit’s legend another couple notches. Streit prepares a Royal Stimulator dry fly. That may be the case on Streit’s solo excursions. Right now, though, he needs a big fish. Whatever pressure he’s feeling is entirely private. Stefan got bored a while ago and wandered up the hill to experiment with wide-angle shots, rendering the point about a prize trout photo moot. I’m sitting on the bank in the slanted afternoon sun watching Streit out on a sandbar in the middle of the river, fishing some riffles between us. 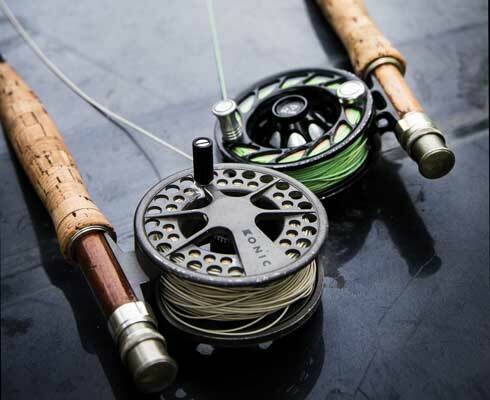 He’ll cast four or five times to an identical point in the current and let the fly carry down to where he can see a trout steadying itself just below the surface of the water. I wait until I figure he’s given up on a particular fish before I go wading out toward the sandbar to ask him some more questions. There’s only so much an untrained eye can learn by watching, after all. Big mistake. He had not given up, not by a long shot. He’d had his eye on a hulking brown trout feeding in the shadows right where I, ignoring the direction of his casts, splashed into the water. From the look on his face, you would think I had dropkicked a puppy. “That was the one!” he wails, throwing his head back to the heavens. I laugh nervously, hoping he’s joking. He is not. “That was the one!” he wails again. That’s when I realize something about Taylor Streit that surprises me. This man who, by his own rough calculations, has helped clients haul in some 40,000 pounds of fish over 35 years of guiding is still capable of becoming emotional over the fate of a single trout. There’s something deeply admirable about that. I apologize in as many ways as I can, but a cloud has settled over Streit’s usually sunny demeanor. I think of the environmental campaigns he’s mounted in the past against certain proposed wilderness areas, on the theory that placing land under government protection would make it less wild by inviting visitors. Orilla Verde Recreation Area may be a far cry from wilderness, but at this moment I am that intruder Streit fears. As we trudge back up to the truck, he looks like he just wants to be alone. Over the course of our conversations and email correspondence, it became apparent that those feelings have a long history, one that goes beyond a natural predisposition. Though he’s reluctant to talk about it, Streit was born to a father who had just returned from serving as a machine gunner in World War II, which affected his childhood in ways he doesn’t care to spell out. “I just kind of got out of the house quick when I was a little kid and was gone fishing,” he says of the eight or more hours a day he’d spend outside. In high school, his flies helped give him space from the wild crowd he ran with. “It’s kind of saved me from being behind bars or something,” he says. He reminds friends who are aging alongside him that even if they can’t get to all the spots they once could, any fishing is better than none. He’ll spend weeks alone in his camper on supposed research trips for an upcoming guidebook, fishing in the morning, writing for a couple hours in the afternoon. Lately he’s been working on a different book, a memoir. Sometimes the exasperated guide in him wants to call it Which Way’s Upstream? but it has another working title, too: How Fly Fishing Saved My Life. As we drive back up the canyon to the last fishing spot Streit wants to try, his mood starts to lighten. If he hasn’t quite forgotten about the one that got away—okay, the one I scared away—he’s at least managed to distance himself from the trauma. By the time we reach our destination, Nick and Ron are there, pulling their boat up a ramp, and the guides joke and swap stories about the day. After a while Streit slips away without a word to me or Stefan and rounds a bend to a placid stretch of river, alone. It’s late afternoon. The sun is swaddled in clouds. It spreads a cool, even light across the green water. I pick my way through the tall grasses to the bank, where I squat to watch without a word. Streit is standing hip deep in the middle of the river, pulling fish after fish, one for almost every cast. They’re tiny, but he doesn’t care. He grins and eases them off the hook, lowering each one gently into the water. Aware now of his audience, he holds up a baby trout like a trophy for Stefan. “I forgot how much fun this is!” Streit calls. Then he strikes on a big one. The rod bends taut and Streit lets out some line, calculating how to coax the trout in close enough to slip it into the net strapped to his back. He takes a few cautious steps backward to find the right position and suddenly both fisherman and rod pitch over into the water, are swallowed up by it, so that only his red ball cap is left floating on the surface like a bobber. I jump up to perform lifeguard duty, but Streit is already sloshing to shore like some kind of bedraggled sea monster, laughing gleefully at himself. The fish is gone. In the parking lot he rummages around in his camper for a dry shirt. “Actually, I feel quite rejuvenated,” he says as he buttons it over his thin white chest. “I must say, that’s the best I’ve felt all day.” I study his face, looking for signs of sarcasm, but his wide blue eyes seem genuinely giddy. Before I can wonder at how a sleepless old man has so much more energy than I do right now, Streit has already grabbed his rod and started back for the river. Contributor John Muller is a writer in residence at the Historic Santa Fe Foundation’s El Zaguán property. ALTHOUGH ONE NEVER KNOWS WHAT THE WEATHER AND WATER CONDITIONS ARE GOING TO BE, JUNE IS USUALLY THE BEST FLY-FISHING MONTH FOR TROUT IN NORTHERN NEW MEXICO. HERE ARE A FEW IDEAS FOR WHERE TO CATCH THEM. 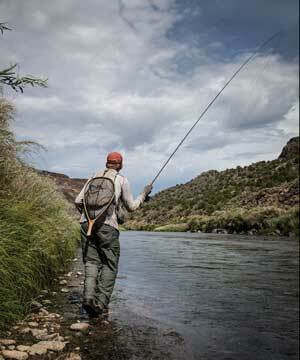 1.The San Juan River is a world-famous fishery below Navajo Dam in northwest New Mexico. To fish “The Juan” in June can be hard on the body because when you are standing in mid-river—in waders—your lower half is 40 degrees and your upper half is 100. Better to get a guide and a float and be all one temperature. And it is critical to have a guide here. If you have never fished it, beware that even a very experienced fly-fisher will struggle without one. 2. The upper Río Grande around Taos can be great fishing in early summer, but it may be out of sorts from runoff, too. Fortunately, as Taos is the epicenter of trout fishing in New Mexico, there are many other streams that will fish well when the great river doesn’t: The Red and Hondo rivers and Pueblo and Costilla creeks are excellent for beginners. These streams have numerous—and conveniently dumb—trout. 3. The Cimarrón River is another good fishery for beginners. Very easy access off US 64 makes this small but rich tailwater stream a great choice in springtime because it is not affected by snowmelt. Be sure to check out its source, Eagle Nest Lake, for trout, yellow perch, and pike. 4. The Chama River has several distinct sections, but the uppermost reaches of the river are usually prime in late June. Profuse mayfly hatches draw good-sized trout up from El Vado Lake. By mid-July, most of the water will be sucked out for irrigation, at which point the nearby Brazos becomes better fishing. 5. Although the Pecos has miles of prime water to fish along the road, the glory of springtime in the Rockies is found in the fantastic Pecos Wilderness. This vast tract has miles and miles of trout streams flush with fish. And June is the backpacker’s month: no bugs or dangerous lightning storms yet, and temperatures are warm. On the main stem of the Pecos, the stoneflies will be hatching. 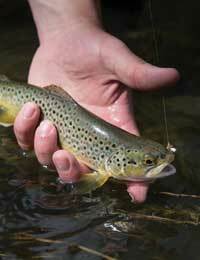 For information on obtaining a New Mexico fishing license, visit wildlife.state.nm.us/ fishing/licenses-permits. The Taos Fly Shop offers hun- dreds of fly patterns, including one called the Poundmeister, designed by Streit himself. 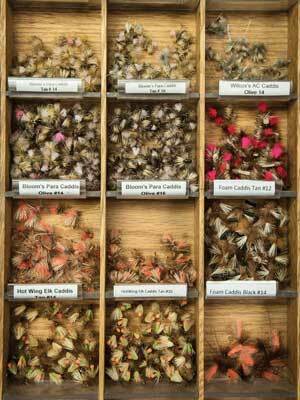 Nick Streit’s two full-service fly shops are among the best in the state. Both offer full-and half-day guided fly-fishing trips. annual guide school and helps instruct two fly-fishing schools.